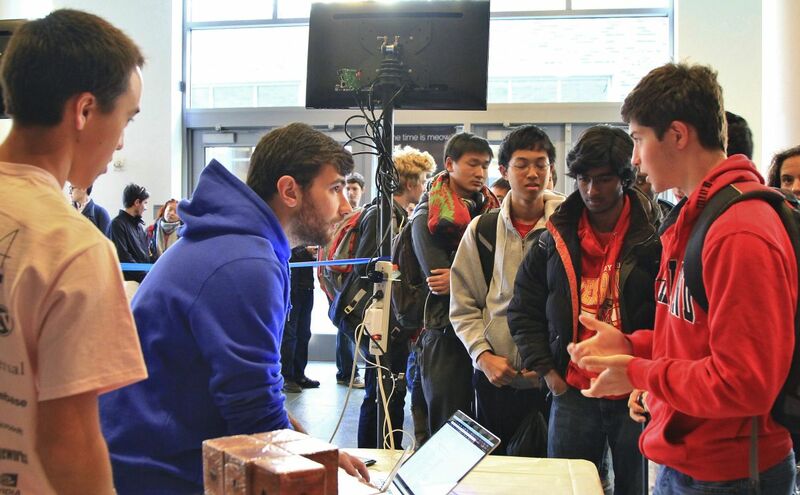 More than 500 students spent their weekend furiously coding as part of HackDuke—an initiative in which students design software to address real-world problems. 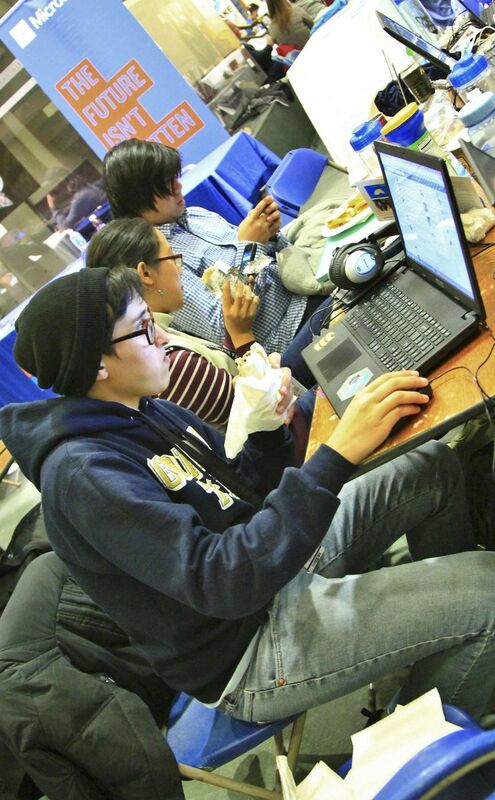 The 24-hour hackathon—which began Saturday at 4 p.m. in the Fitzpatrick Center at the Pratt School of Engineering—featured high-profile sponsors including Google, Facebook and Citrix. The event, which debuted November 2013, focused this year on creating an environment friendly to novice and female coders. Organizers made an effort to recruit female mentors, and saw their efforts pay off, with women making up approximately 25 percent of the total participants. "Tech is traditionally dominated by males," said Scotty Shaw, Trinity '09 and one of the event's organizers. "Especially hackathon—the word ‘hacking' just sounds like a male thing. We are really trying to push for female participation, because that’s a lot of talent we are not tapping into, a lot of brainpower being left behind." Junior Yu Zhou Lee, another organizer of the event, said the turnout from female participants was impressive, noting that most hackathons attract less than 10 percent women. "I actually just met three women engineers who came with no computer science background, and now they are more than ready to build their own program," Lee said. Shaw also emphasized the openness of the competition, noting that students of all majors—with or without coding experience—were welcome to participate and would receive mentors. Approximately half of the participating undergraduate students came from Duke, and the other half hailed from a variety of colleges nationwide, some as far away as Berkley, California and Waterloo, Canada. The hackathon asked students to collaborate on software projects addressing four "tracks of impact"—Health and Wellness, Education, Inequality and Poverty and Energy and Environment. A panel comprised of mentors from participating companies chose a winning group from each division. “[The fall] is when tech companies are recruiting, and they love to see that you build something," Shaw said. "Honestly, classes don’t necessarily teach you real-life skills, but at Hackathon, you can say that I built something that can help with health and poverty issues." The winning team in the Health and Wellness category developed an app called Flash Aid, which uses crowd sourcing to reduce response times in medical emergencies. Siddu Duddikunta, a freshman from Georgia Institute of Technology on the team, explained that citizen responders within a mile of a victim would able to arrive before an ambulance. The Education team developed the idea for JustRead, an inexpensive smartphone-based scanner that provides audio versions of texts for the blind. The winning group in Poverty and Inequality created a process to allow users to donate money from video ads they watch online. And the Energy and Environment group developed a program to encourage composting. The event was organized by Duke undergraduate students in collaboration with Major League Hacking, the Kenan Institute for Ethics, Code for Durham and DurhamCares.org. The event featured a speech by Durham Mayor William Bell and opportunities for student participants to interact with representatives of major technology companies.